Green on the Green is a free, one-day community festival that offers visitors a variety of ways to “go green” in their everyday lives. The annual event, which gathers companies, organizations and community groups from all over Columbus, will take place on Saturday, May 9 from 8 a.m. to 1 p.m. on Worthington’s historic Village Green. For the past five years, Ferris and her team have worked hard to grow Green on the Green. Hosted in conjunction with the Worthington Farmers Market and Plant Fest, this year’s event promises to be bigger and better than ever. From educational demonstrations by organizations like the Ohio Ecological Food and Farm Association and the Ohio Wildlife Center, to presentations by local schools and community groups, to a host of green vendors and exhibitors, there is something for the whole family to enjoy. 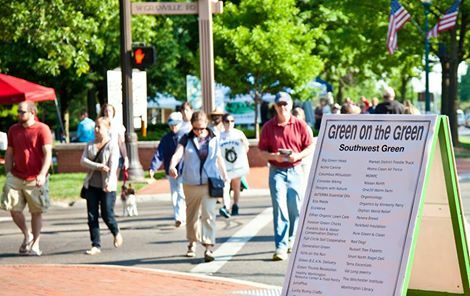 Participants will have the opportunity to shop for re-purposed or recycled items from a number of local Worthington businesses, experience a walking garden tour and learn about simple ways to conserve resources like water and energy. Additionally, the Arch City Rowing Club will host a spring plant sale, and Shimmy Mob, a national belly dancing company, will surprise unsuspecting visitors with a flash mob. Worthington’s Village Green is located at St. Rt. 161 and High Street in Worthington. Calling all green thumbs! Plant Fest is your one-stop shop for everything from plants and hanging baskets to fruits, vegetables and gardening and landscaping supplies. Visitors will have the opportunity to shop for annuals and perennials, herbs, garden art and decorations, as well as jewelry, candles and so much more. The event, which will be integrated into the popular Worthington Farmers Market, will also feature live music and delicious food vendors. And remember, Plant Fest takes place the day before Mother’s Day – so stop by and pick up something your mom is sure to love. Plant Fest takes place at the south end of Worthington’s Village Green.